77 by 44cm., 30¼ by 17¼in. the freedom that was permitted in the case of a portrait painted at the volition of the artist rather than at the behest of a patron. The painting remained in Watts's possession for fourteen years – hanging in the artist's adopted home Little Holland House – and only being sold in 1876 to the avid collector of the artist's works Charles Rickards. The background to the painting is the wallpaper which decorated a room at Little Holland House and which appears in other Watts portraits. The representation of her undressed hair, which falls to her shoulders and breast, its lovely pale colour showing against the dark material and echoed by the gold of the braid, makes clear that this is a portrait of a woman who may be regarded as still in a state of adolescence and painted by someone who was privileged to observe her in her girlhood. According to the conventions of Victorian portraiture it was not permissible for women who were married to be shown with their hair loose, with associations of déshabillé which would not be considered appropriate to be seen by anyone except the woman's husband. 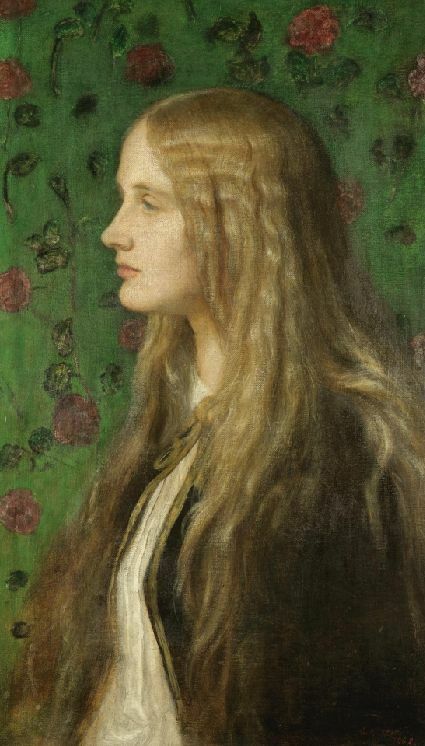 A year later, in the course of his short lived marriage to Ellen Terry, Watts painted a series of portraits of her which have something of the same suggestion of physical intimacy. Edith recalled sitting for the portrait: on the first occasion in May she was 'made to sit for about an hour and a half' in a studio that was uncomfortably warm. Then, in June, by which time the final arrangement of the portrait must have been arrived at, she described how 'they pulled down my hair and then made me sit to Mr Watts. It was such a bore'. on a canvas of a particularly coarse weave, the texture of which lends unity to the composition. In 1864 Edith Villiers married Robert Lytton the son of the novelist Edward Bulwer-Lytton. Lytton was a diplomat who served as viceroy of India (and whose duty it was to proclaim Queen Victoria as empress of India in 1877), and was later British ambassador in Paris. In addition has a writer of distinction, publishing under the nom-de-plume of Owen Meredith, a series of volumes of poetry. Robert Lytton was made 1st Earl of Lytton. He was himself painted by Watts in a portrait now in the National Portrait Gallery. Robert Lytton died in 1891, his wife Edith surviving him by forty-five years.